I remember back in high school I always told to myself that I wasn’t the type of girl that would be bowled over by flowers or any romantic things. But you know what, I am =], and it’s not the present, but the gesture. 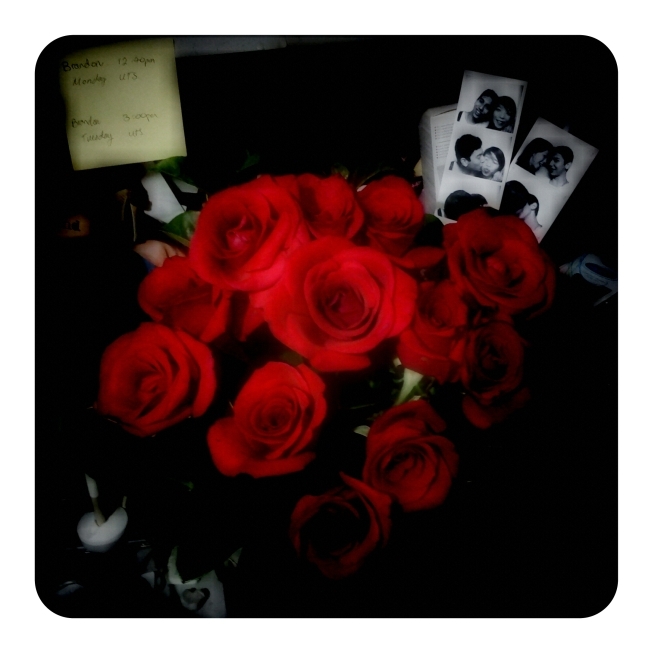 It really touches me that someone cared enough to surprise me with flowers, and I really was surprised. And it made me laugh, in a good way =]P, that a friend would forced us back together so he could take a picture. And I really do appreciate that he did that for us =]. and thank you Nathan S for the boxes =]P.
Happy Valentine’s Day you crazy kids =]. You know, this will be the first valentine’s day where I’m spending the whole day with one person =]. I’m really excited, but I’m also a little sad that our little pre/post Valentine’s Day tradition has died in the last two years. Hopefully next year we can revive it =D. – Giving advice to friends regarding relationships. – Getting myself into situations. – Realising something, and doing the complete opposite pretty much next day. Oh there’s more, but these things have been on my mind lately. One for providing the calming words =] and the other for ranting with me XD.